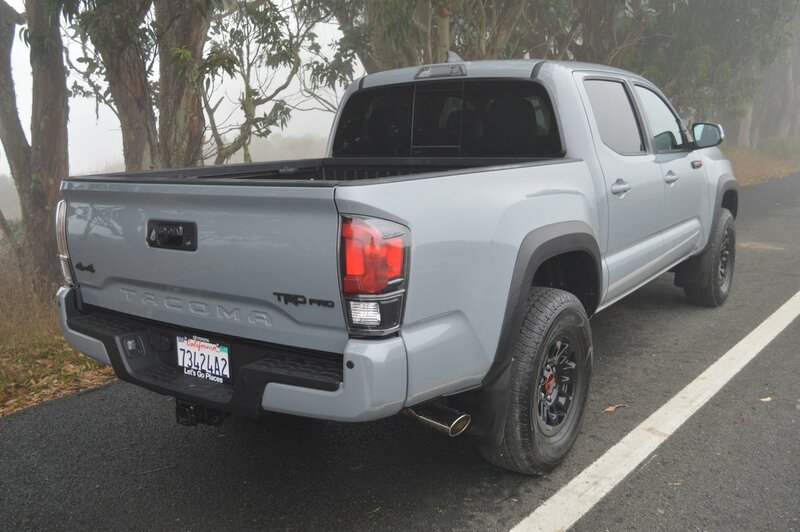 Opt for the TRD PRO version of the Tacoma compact pickup and you’ve got a military spec off-roader that will out-butch everything but a monster truck. 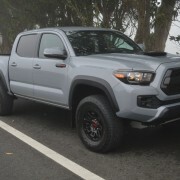 Toyota Racing Development (TRD) is hardly a newcomer to assaults on Baja, or the urban jungle for that matter. 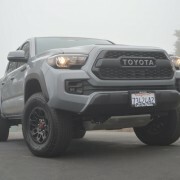 TRD trucks have been running and winning the Baja 1000 for decades, and the breeding that goes into making the Tacoma competitive there shows everywhere you look here. First, there’s the truck’s sky high ride height which necessitates a healthy jump step to insert yourself in the cab. Next, there’s the no-nonsense look of this “Cement” colored brute. 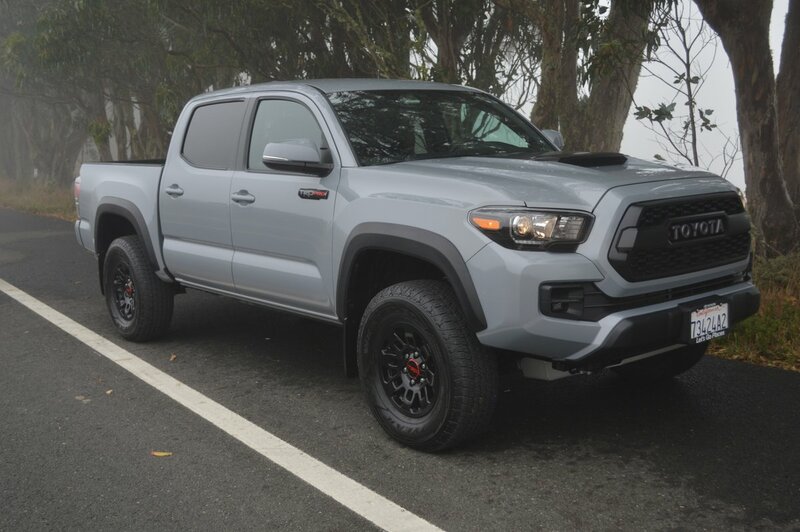 With its monochromatic grey paint highlighted only by “TRD PRO” informational placards on the flanks, this Tacoma stands ready to battle the toughest terrain you can throw at it. 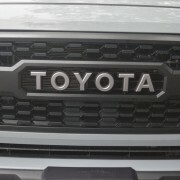 To that end, Toyota equips it with black alloy rims highlighted by red TRD center caps. 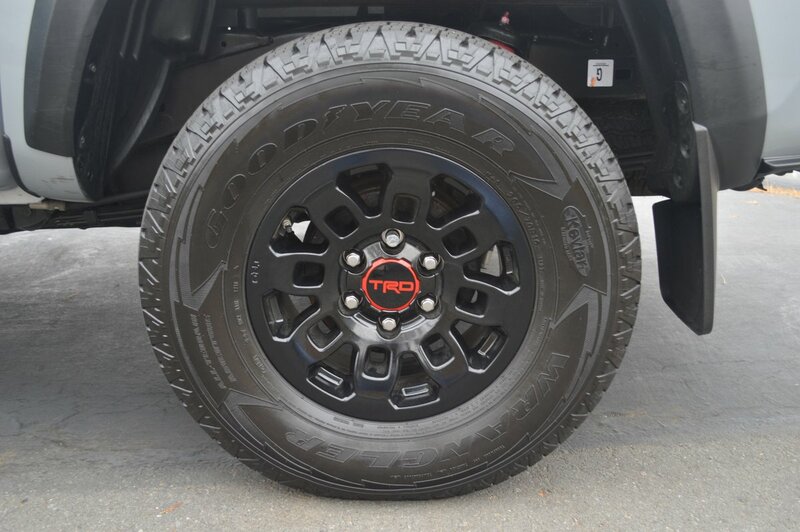 On each rim you will find a 265/70R 16 Goodyear Wrangler off-road tire with more writing on its sidewall than a Dead Sea Scroll. The most pertinent notice concerns the wear rating (WR) of these Kevlar-reinforced Goodyears. 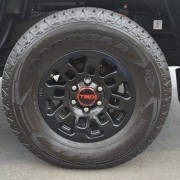 With a WR of 640, you can bet these tires will take a real pounding while enjoying a long tenure on your Tacoma. 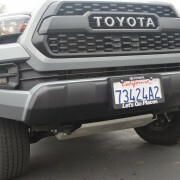 You can also expect them to afford less than sticky traction on hard shell pavement, since their compound lies at the rock end of the tire wear spectrum. 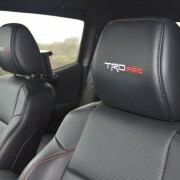 I found this out first hand when I pitched the TRD PRO into a tight turn. The front tires lost traction, and the truck washed out in understeer. 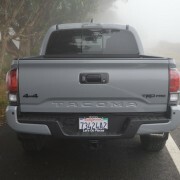 Caution is essential when driving this Tacoma on pavement. In the dirt, however, no impediment is too great for this race bred package. 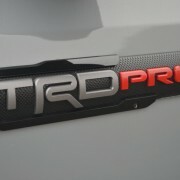 Up front you’ll find a bullet proof TRD branded skid plate, which is easily seen because the TRD sits so high off the ground. 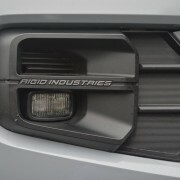 Also a pair of sly looking Rigid Industries LED fog lamps. 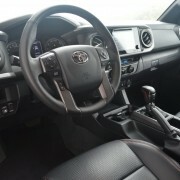 Do a walk around and you can peer into all four wheel wells and admire the structural soundness of the frame rails, the immense solidity of the TRD racing shock absorbers wrapped in coil springs, and the massive size of the front anti-sway bar and its drop links. Of course all this super size componentry affords the stiffest ride you can imagine. 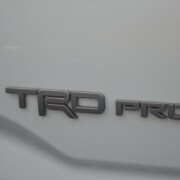 The TRD hops and bounces like a thoroughbred stallion kicking the stall at post time. 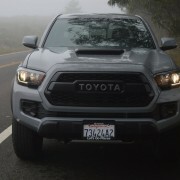 Once you get acclimated to the handling idiosyncrasies of this Tacoma, it’s really a blast to drive. 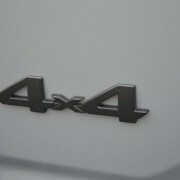 Its handling is so direct and elemental that nothing cushions or decompresses the joy of driving it. What you see is very much what you get. 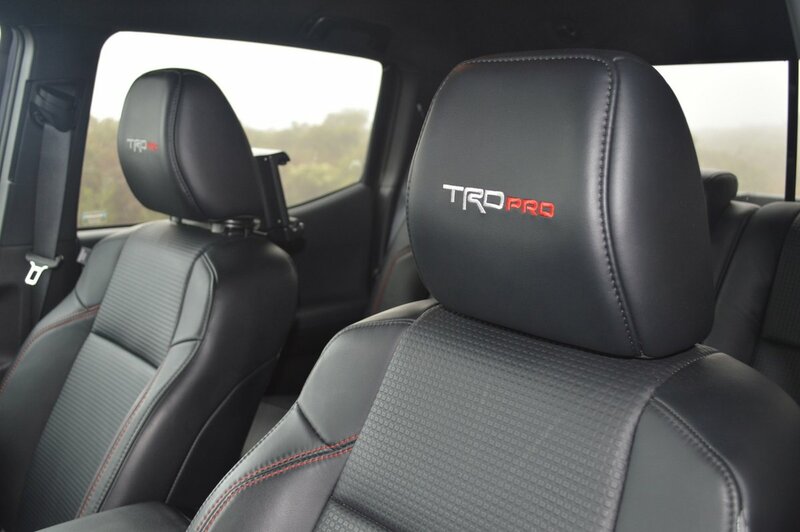 There are few vehicles left for sale as honest and straightforward as the TRD PRO, so enjoy this breath of fresh air. Like the ride, the interior too is uncomplicated, and as useful as a work boot from Acme. 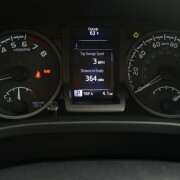 The dash is delightfully straightforward in an old fashioned way. There are big fat knobs for every vital HVAC function, and a useful 7 inch touchscreen for audio and navigation override. 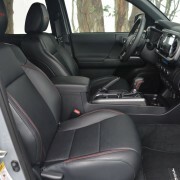 The seats slide and tilt with manual controls, but they are thoughtfully equipped (up front) with 3-stage heaters. 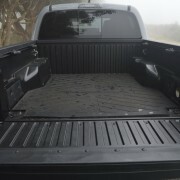 There’s an electrically operated center rear window at the back of the cab, should you need to carry items longer than the 6 foot bed will accommodate. The back seats also flip and fold against the front seats, so you can easily convert unused cab space into additional storage room. 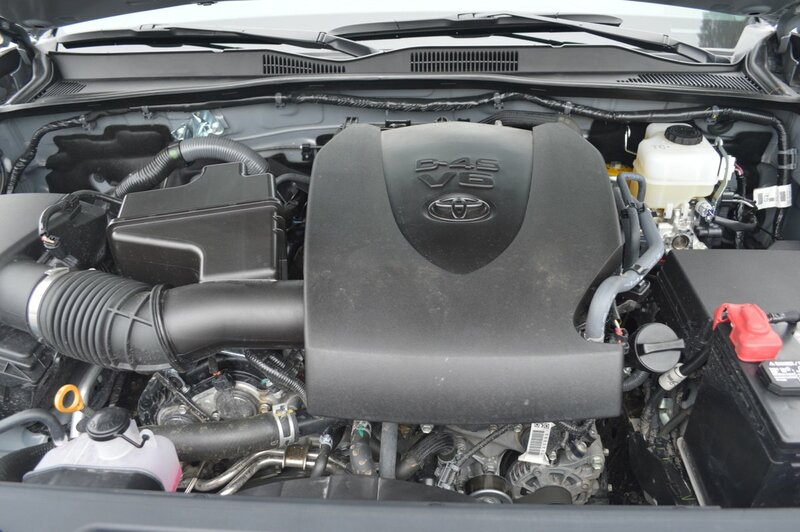 The 3.5 liter V6 engine, which produces 278hp, sounds off through a TRD exhaust system that issues a guttural blat when you nail the throttle. 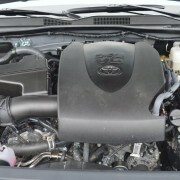 The engine has enough torque (265lb.-ft.) to tow a trailer weighing 6,400 pounds, and the TRD comes equipped with a proper receiver hitch plus all the ancillaries needed to cool the driveline when towing: Automatic Transmission Fluid cooler, Power Steering cooler, Engine Oil cooler, plus a 130 Ampere Hour alternator. 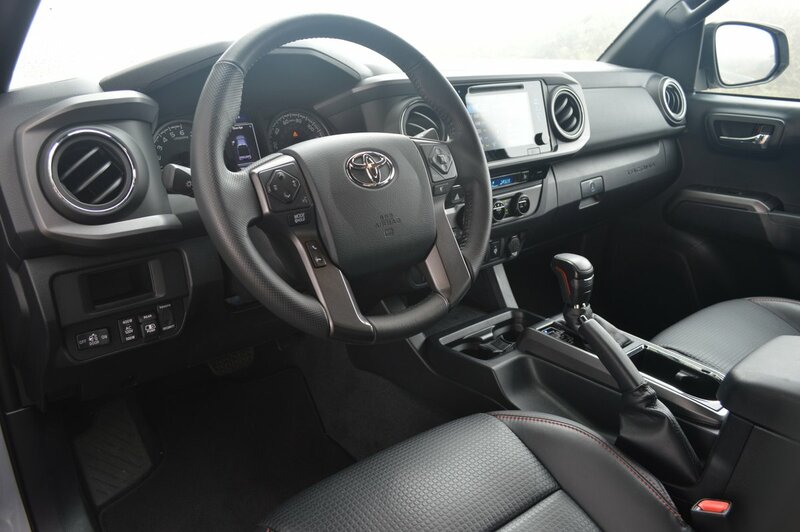 4 Wheel Drive is available either full time or part time, and Toyota supplies the TRD PRO with an electronically controlled transfer case and a limited slip differential. It’s hard to imagine an on- or off-road situation that would stymie this truck. 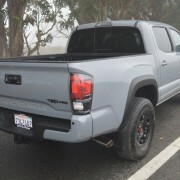 The TRD PRO version of the Tacoma pickup looks like a Baja winner. 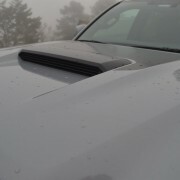 About the only phony note to its cowboy get-up is the hood scoop which doesn’t actually vent cold air into the engine room. That’s a mighty small complaint list for a very fetching truck. Race Car Schools Are Flooring It!